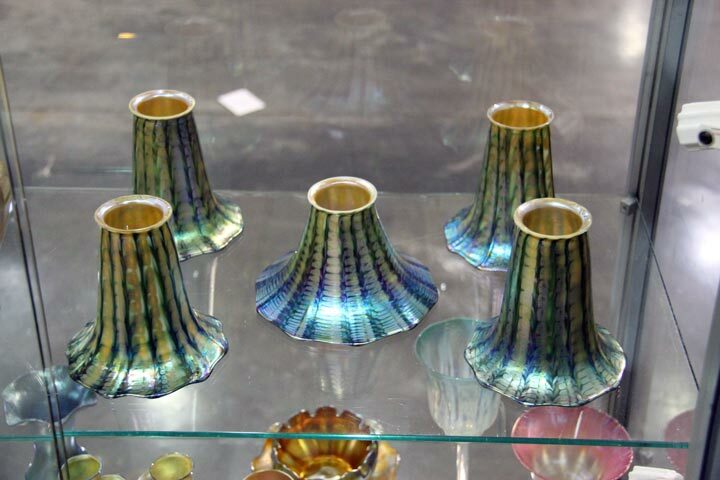 The Baltimore Summer Antiques Fair ended the summer show season. The fall season will begin with the AVENUE show at the Park Avenue Armory on Thursday, September 22nd. Since I have less time to write about the interesting things happening in the antiques world, I am posting new blog entries once or twice a week — Mondays and Thursdays. If you don’t see a new post on Thursday, it’s because I was too busy, so please look for a new one the following Monday. We exhibit at so many shows that most of them blend together. Every once in a while, one becomes memorable. This Baltimore show was that one. Allow me to explain. I can’t name a show that began with an earthquake, ended with a hurricane, and had plenty of business in the middle. We started setting up the show on Tuesday. 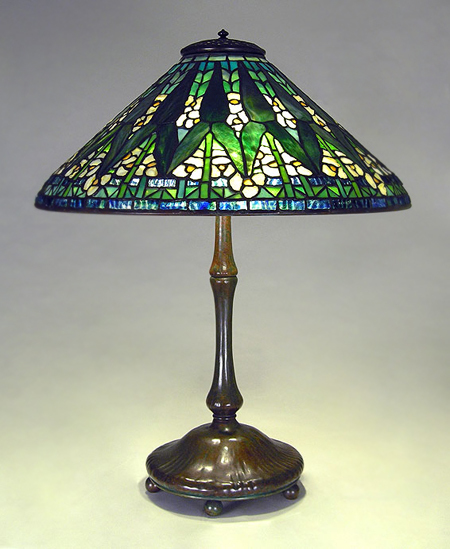 In the middle of a telephone call regarding the purchase of a Tiffany lamp, the ground started shaking. I knew immediately it was an earthquake and told the person on the phone. He couldn’t believe it. Most East Coasters are not familiar with earthquakes, but having experienced two of them in California, I knew what was happening. It was fairly gentle and didn’t seem to last more than 10-15 seconds, so I continued doing my business as if nothing had happened. Ten minutes later, they evacuated the entire building. Thirty minutes later, we were permitted back into the building and continued working. Attendance at the show seemed lighter than usual, but that’s not what counts. Who shows up is much more important than how many people show up. For us, the right people showed up. Interest and sales were excellent, with most of it coming in, guess what? — Tiffany lamps and French glass. If you follow my blog, that will come as no surprise. The hurricane hit Baltimore in the middle of the night — great timing. We slept through most of it. I thought no one would show up on Saturday because the hurricane was bearing down on Baltimore. But I was wrong. There were lots of people at the show and sales were best on Saturday. Never would have guessed that. What made it even better was that the sales were all to new clients. In asking around, most dealers had very good shows. I did hear a few complaints, but that was expected. There’s never a show where 100% of the dealers do well. Didn’t think anyone would show up on Sunday, but as the weather cleared, quite a few people showed up. No sales on Sunday, but you won’t hear any complaints from me. That’s two fabulous shows in a row. 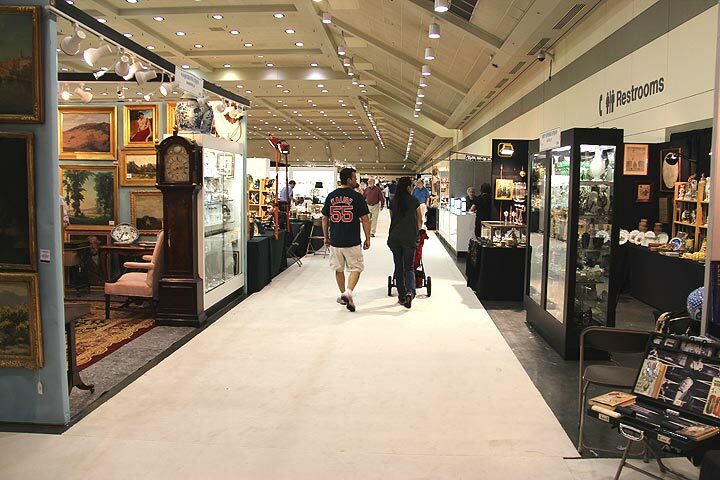 The Baltimore Summer Antiques Fair ends the summer show season. The fall season will begin with the AVENUE show at the Park Avenue Armory on Thursday, September 22nd. Since I have less time to write about the interesting things happening in the antiques world, I am posting new blog entries once or twice a week — Mondays and Thursdays. If you don’t see a new post on Thursday, it’s because I was too busy, so please look for a new one the following Monday. This is one of the rare times in the summer that I have the time to write a Thursday blog. Next Monday’s blog will be about the results of the Baltimore show. The results might be skewed by the hurricane that is roaring up the East Coast. It could head east and be no problem or it could head west and affect the whole East Coast. Not to mention the earthquake that hit the East Coast. I just exhibited at two shows in California. The entire time, I was thinking to myself that an earthquake could hit at any moment and do extensive damage to my inventory. When we left with no earthquake, I was relieved. It was surreal to come to Baltimore and experience a once-in-a-century earthquake. I knew instantly that it was an earthquake, since I’ve been through two of them in California. But it was so gentle in Baltimore that I wasn’t the least bit worried. Back to the Baltimore show. 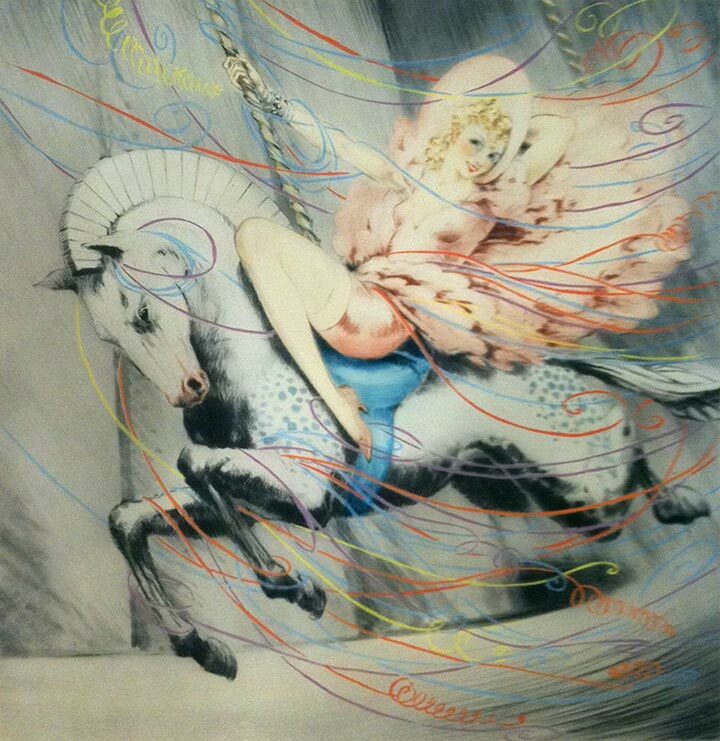 It’s such an amazing show — only equaled or exceeded by the amazing Miami Beach Antiques Show. 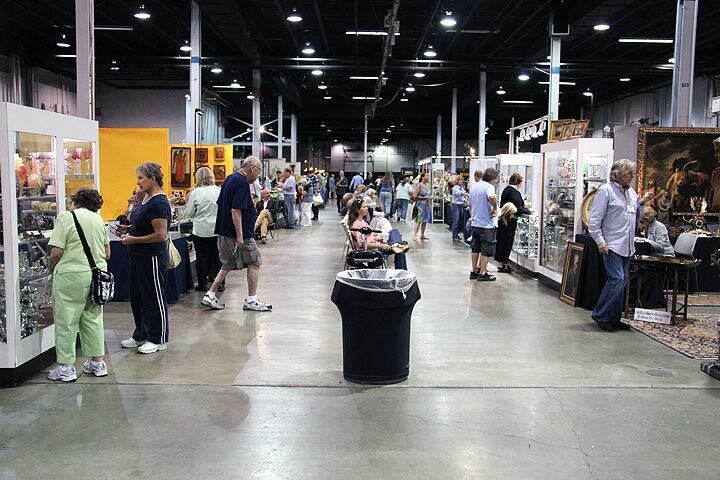 The Baltimore show is huge, with great dealers, some of whom exhibit at very few shows. If you make the trip to Baltimore you’ll see a vast selection of antiques that you would be hard pressed to find anywhere else. Where else can you find dealers from all over the United States and some foreign dealers, all under one roof, at the same time. It’s really incredible. There’s almost nothing that you can think of that isn’t here for sale. If you’re concerned about the possible hurricane, come early. Right now, the hurricane isn’t due until Sunday, if at all. The show opens today, Thursday, August 25, at noon, and continues until Sunday at 6 PM. The scope and breadth of the displays is truly astonishing. You will not regret your decision to come. Personally, I’ve got a really great selection of items, most of which you haven’t seen before. 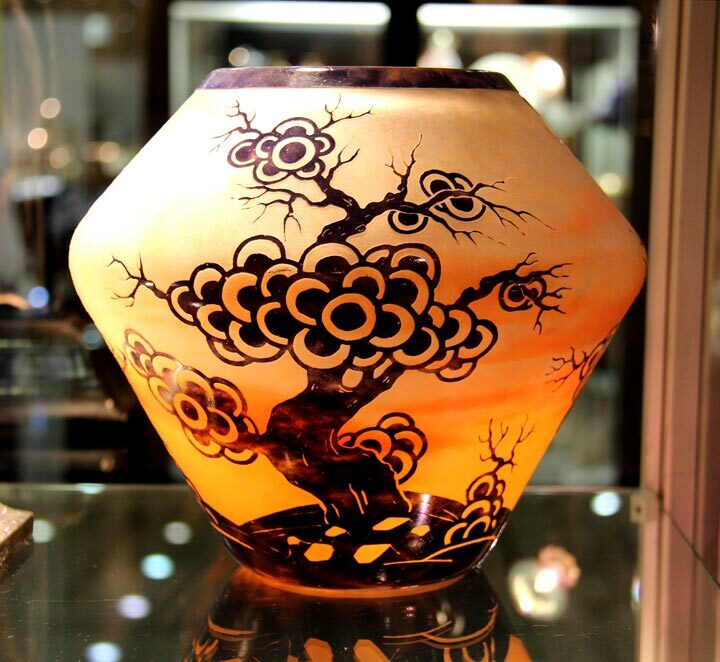 I bought a few new extraordinary items, including a really fantastic B&S internally decorated vase, an ultra rare Le Verre Francais vase with Bonsai trees, and a fantastic Quezal set of decorated shades. Make sure you visit my booth. I’ve moved to a very big booth in the corner of the building. As you enter, make a right turn, and go into the corner. That’s the location of my new booth. 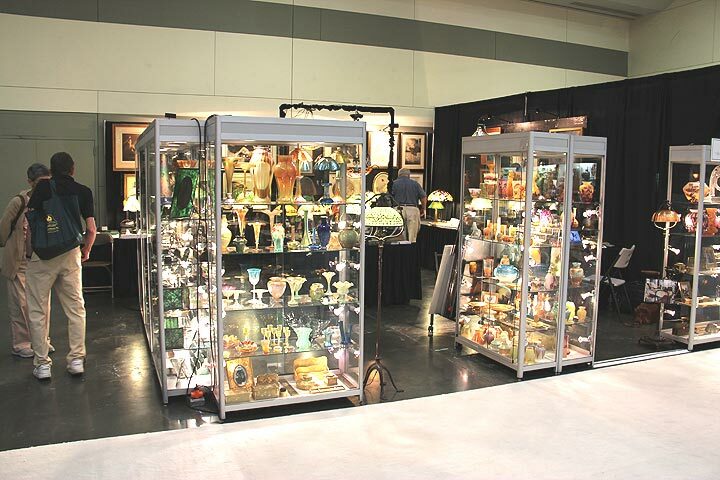 The summer show season will end with the Baltimore Summer Antiques Fair this week, Thursday, August 25 – Sunday, August 28. The fall season will begin with the AVENUE show at the Park Avenue Armory on Thursday, September 22nd. Since I have less time to write about the interesting things happening in the antiques world, I am posting new blog entries once or twice a week — Mondays and Thursdays. If you don’t see a new post on Thursday, it’s because I was too busy, so please look for a new one the following Monday. What a difference a day (city) makes! (Click this link to sing the song along with me and Dinah Washington.) The difference between Southern California and Rosemont, IL, is much greater than the 2000 miles that separates them. Changing cities from Pasadena to Rosemont felt more like changing decades, not cities. Although attendance wasn’t great, those who did attend were serious. Most of the dealers I spoke to were very pleased with their results. 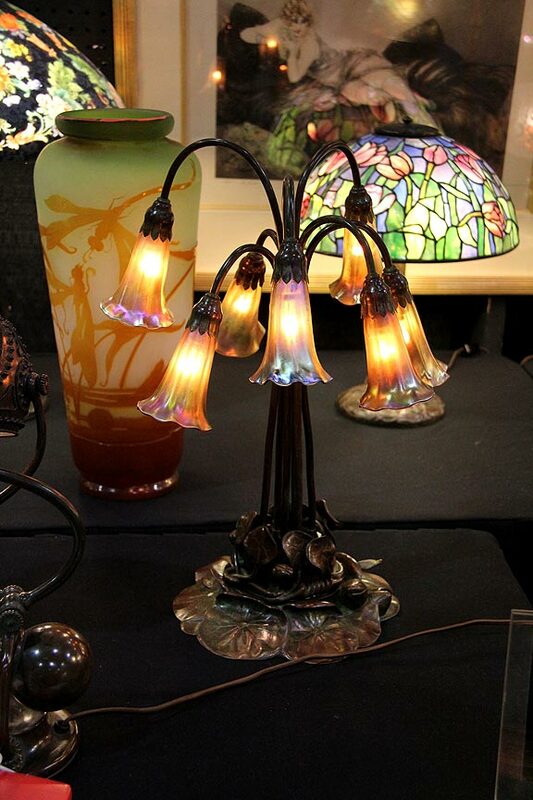 Personally, I had an excellent show, with the most interest and sales in Tiffany lamps and French cameo glass — the same areas that have been strong for a long time. One furniture dealer told me he didn’t do well, but that seems to be a trend that is continuing. Buyers prefer newer designs, by artists like Sam Maloof and George Nakashima. Their works continue to sell well, especially at auction. 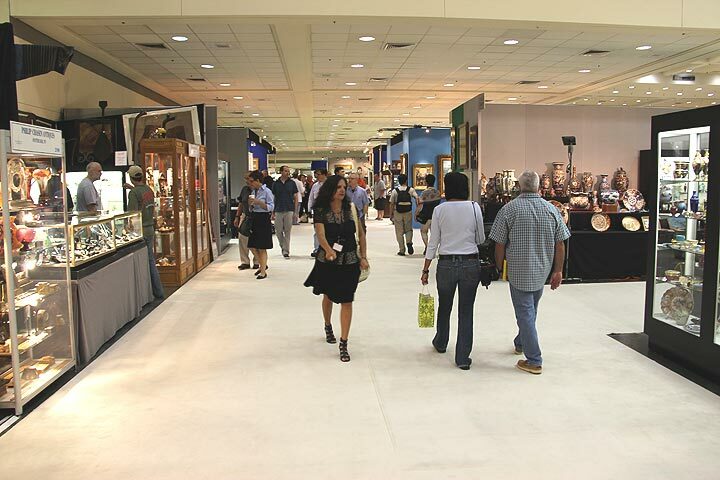 Serendipitously, the ANA annual coin show was held at exactly the same time as the antique show, in the same building. Most coin dealers I know are bored with coins, but they love antiques. They visited the antique show and made more than a few dealers happy. Next August, the ANA show will be held in Philadelphia, but the following four years, the ANA show will be held in Rosemont. 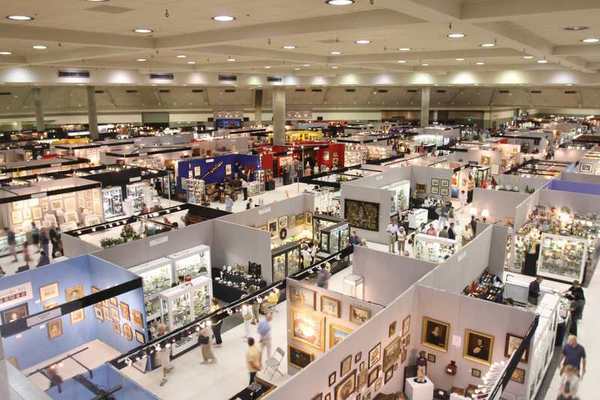 Rosemary Krieger, the promoter of the antique show, told me that she has linked her show dates from 2013 – 2016 to the coin show. It’s a great idea and all the exhibiting dealers will benefit. For those dealers who have stopped exhibiting in Rosemont in August, I suggest you change your minds and try it again. You missed out on a good show this time. The summer show season is in full gear. 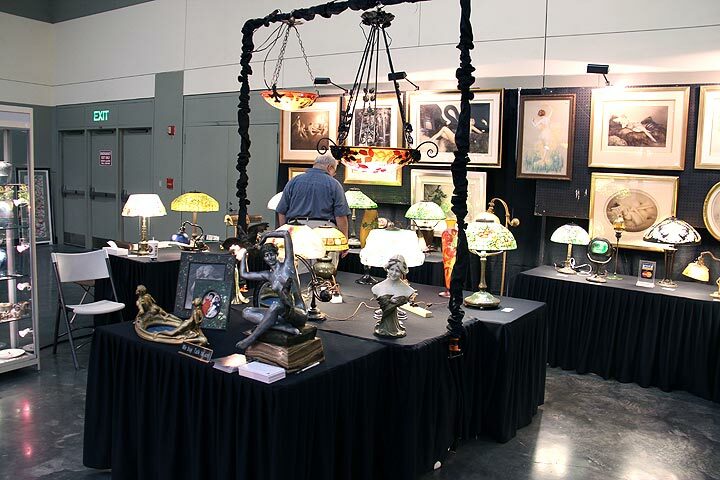 In July and early August, we exhibited at the Redondo Beach Antiques Show and the Pasadena Antique Show in California. In mid to late August, we’ll be in Rosemont, Illinois, for the Chicago Summer Antiques Show and then Baltimore for the Baltimore Summer Antiques Fair. Since I have less time to write about the interesting things happening in the antiques world, I am posting new blog entries once or twice a week — Mondays and Thursdays. If you don’t see a new post on Thursday, it’s because I was too busy, so please look for a new one the following Monday. 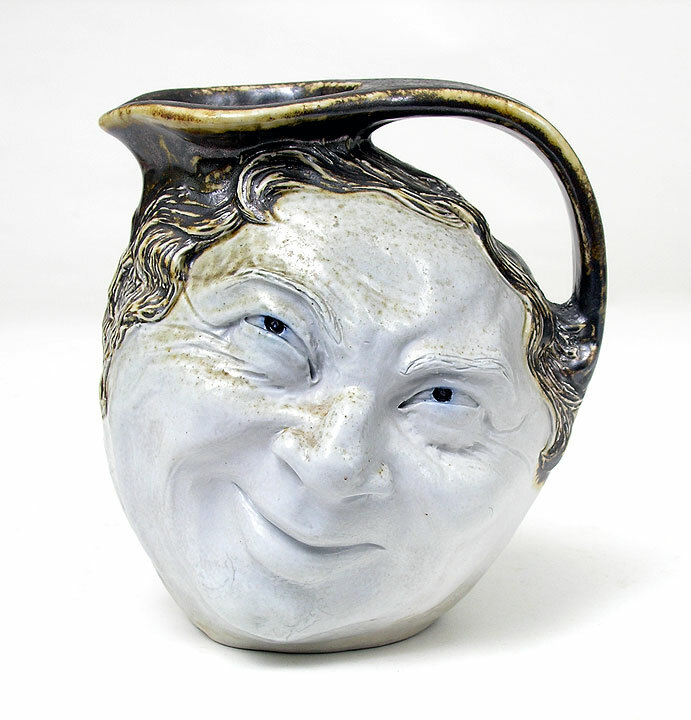 A wonderful Martin Brothers face jug. One of the many new items I am bringing to the shows. This week we’ll be exhibiting at the Chicago Summer Antiques Fair, which takes place at the Rosemont Convention Center in Rosemont, IL. It’s adjacent to O’Hare Airport, so it’s quite convenient if you want to fly in to visit the show. It’s not a big show, but it’s very nice quality, so it’s surely worth a visit if you live anywhere in the Greater Chicago area. The show opens this Friday, August 19, at noon and continues until Sunday, August 21, at 5 PM. 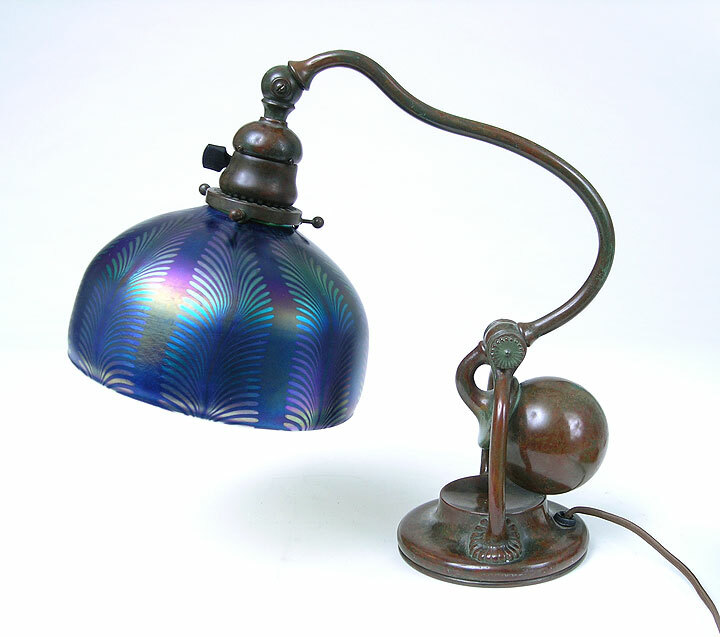 I’m bringing the largest and best selection of Tiffany, Handel and Pairpoint lamps that I’ve brought to any show in many years, including a gorgeous Tiffany Studios 7-light lily and a super Tiffany Studios 20″ diameter Arrowroot. Additionally, I’m bringing a deep selection of the finest in French cameo glass by Daum Nancy and Emile Galle, and American glass by Tiffany Studios, Quezal, and Steuben. I will also have a great selection of American ceramics by Rookwood, Grueby, Van Briggle and others, as well as an amazing collection of Louis Icart etchings, including some extremely rare ones, including Mardi Gras, Melody Hour, Miss America and others. 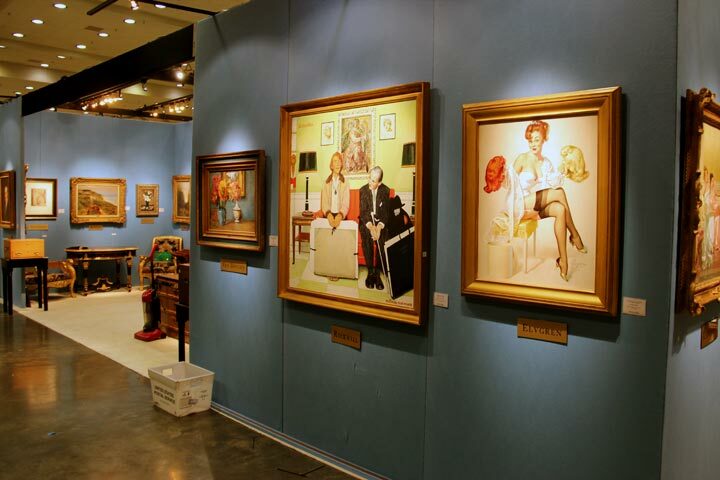 The following week, the whole antiques world moves to Baltimore for the biggest and best show of the summer. 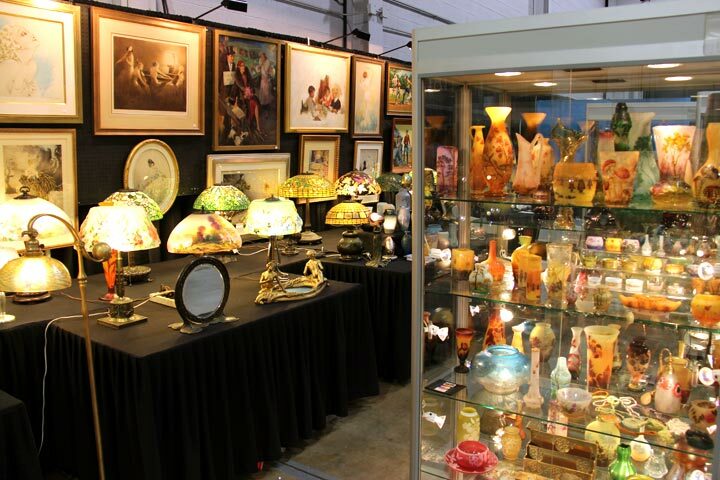 The Baltimore Summer Antiques Fair is not only huge, but super high quality, with some of the best antique dealers in the country, some of whom exhibit at very few shows during the entire year. Thousands of buyers travel to this show from all over the world, including many from Europe and Japan. If they can travel to Baltimore from Japan, you can travel to the show from anywhere. 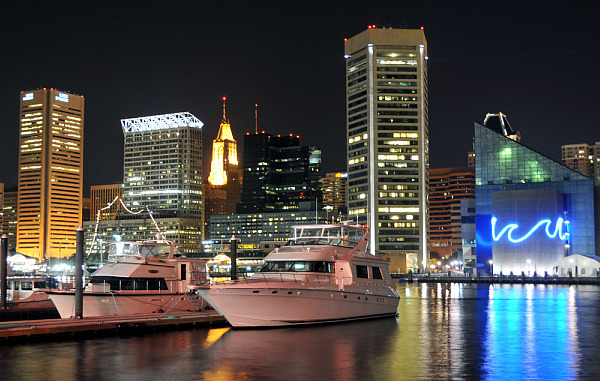 Not only is the show exciting, but the downtown area of Baltimore has undergone an a complete revival in the twenty years since I’ve been doing the show. It’s almost unrecognizable from what it used to be. 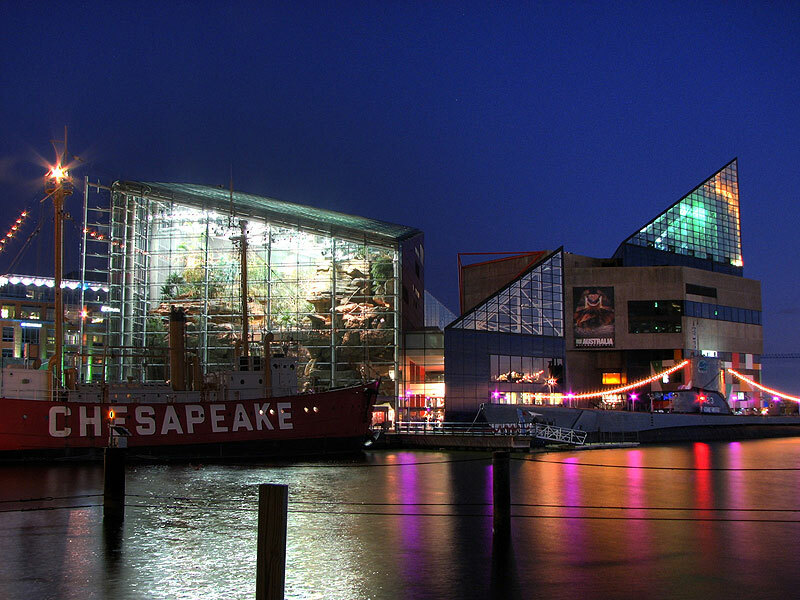 There’s lots to do at the Inner Harbor, the National Aquarium, the Maryland Science Center, Harborplace and the Gallery, cruises on the Inner Harbor, Little Italy, etc., etc. And don’t forget to eat crabs at world-famous Obrycki’s of Baltimore. The summer show season has started. 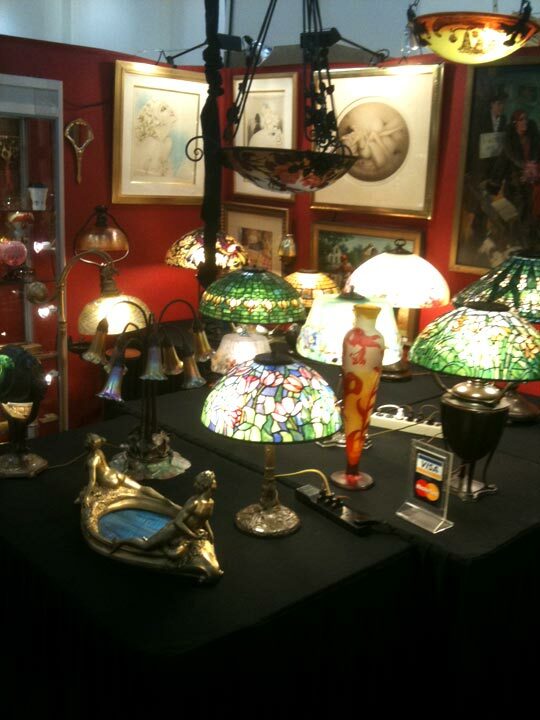 The last two weeks we exhibited at the Redondo Beach Antiques Show and the Pasadena Antique Show. 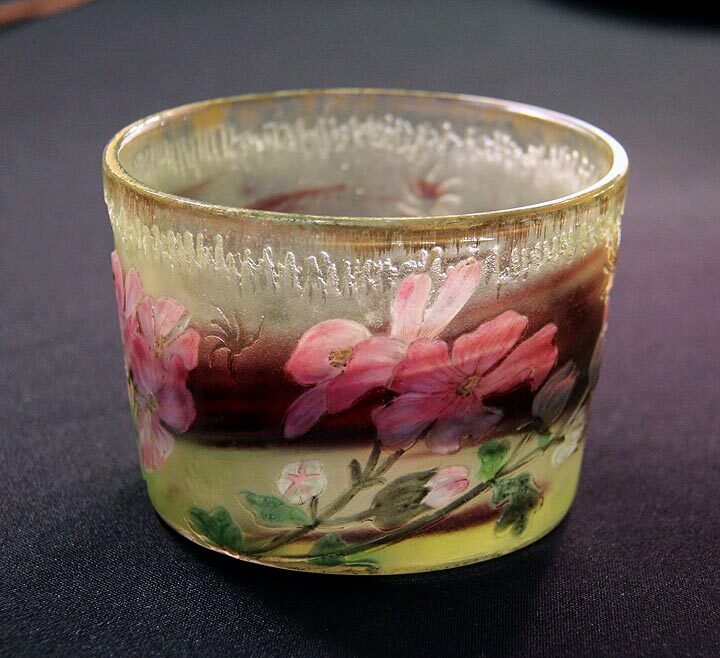 Next week, we’ll be in Rosemont, Illinois, for the Chicago Summer Antiques Show. Since I have less time to write about the interesting things happening in the antiques world, I am posting new blog entries once or twice a week — Mondays and Thursdays. If you don’t see a new post on Thursday, it’s because I was too busy, so please look for a new one the following Monday. I’m writing this blog on Saturday afternoon, August 6, 4:15 PM. As of today, the show is going poorly, but more than a few shows have been saved on Sunday. (I’ll add to this post if it happens.) This whole trip to Southern California has pretty much been a waste of time, energy and money. 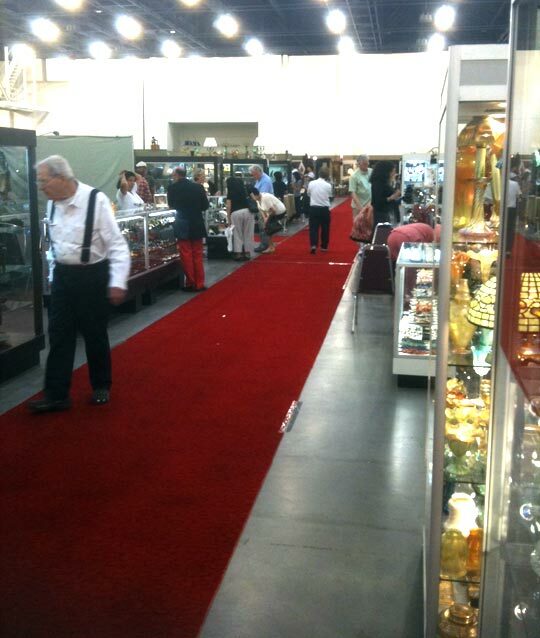 Last week we exhibited at the Redondo Beach Antiques Show. The show has gotten quite a bit smaller from the first time we exhibited there. A large part of the show used to be outdoors, but last week there were only a handful of outdoor exhibitors. It’s part of a larger problem with antique shows. Too many of them are shrinking. Many exhibitors have chosen to stop exhibiting, either because they weren’t doing well or because they were getting too old. In addition, there aren’t enough young dealers and collectors to replace the aging ones. The show wound up being neither a money maker nor a money loser. In dealer’s lingo, we bought our way out of the show. The translation is that we didn’t sell enough to make any money, but we bought some items that will yield profits down the road when they are sold. The Pasadena Antique Show is a more established show. It took place at the newly renovated Pasadena Convention Center. It looks like an official antique show, but it too is substantially smaller than it used to be. Attendance was decent, but not great. Interest and sales were poor, but in walking around, many dealers were making sales. It wasn’t our turn. I’ve met some great clients at these two shows in the past and it’s possible I’ll meet others in the future. I’m not giving up yet on these shows and Southern California in general, but I may if they don’t improve. I’ll keep you posted. The summer show season has started. 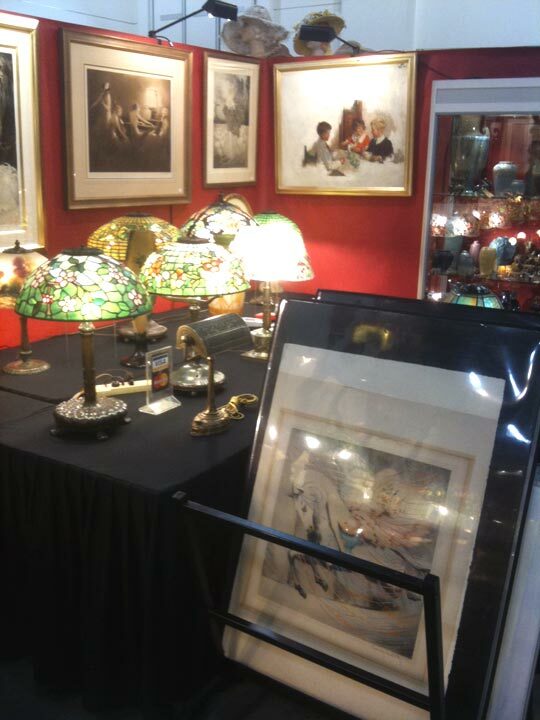 Last week we exhibited at the Redondo Beach Antiques show and this coming weekend we will be exhibiting in Pasadena. Since I have less time to write about the interesting things happening in the antiques world, I am posting new blog entries once or twice a week — Mondays and Thursdays. If you don’t see a new post on Thursday, it’s because I was too busy, so please look for a new one the following Monday. Christie’s held its Important Watches sale in Hong Kong on May 30, 2011, grossing $21,130,486. 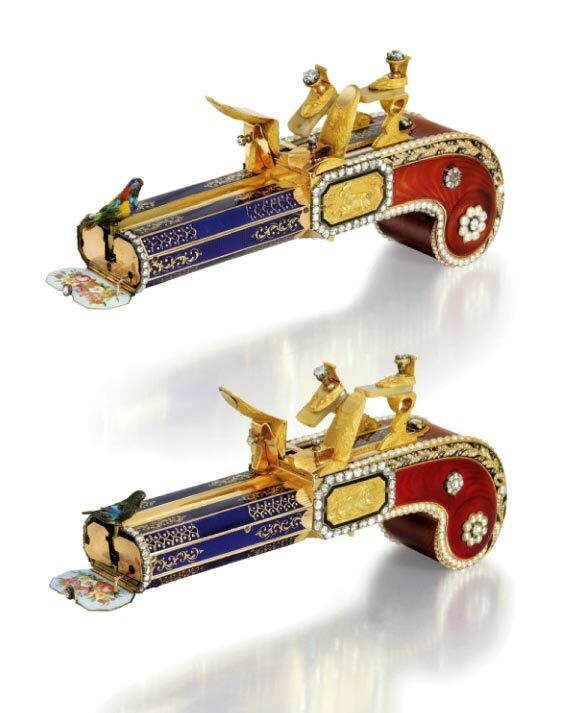 Included in the sale were a pair of extraordinary singing bird pistols, lot #2174, attributed to Frères Rochat, France, dating from 1820. They are the only pair known to exist. It’s interesting, but not surprising, to note that the pistols were included in a sale of watches. Wealthy men like expensive jewelry and toys. Watches are men’s jewelry and singing bird pistols are men’s toys. Many Chinese buyers have become wealthy in recent years and have been flexing their economic muscles. They are mostly repatriating Chinese antiques at extraordinary prices, but they are also buying fine non-Chinese antiques. Christie’s produced a very interesting and informative 4½-minute video about the pair. It’s enjoyable, so I suggest you click on the following link to view it. Christie’s video. The pair was estimated to sell in the range of $2,580,950 – $5,161,900, and hammered at $5,866,499, including buyer’s premium — at the top end of the estimate. The consignors had to be pleased.